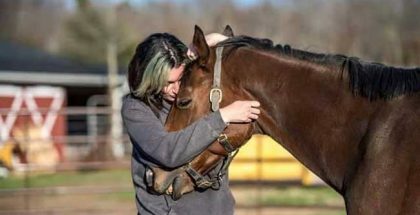 Kaitlin and Coteau Curlin: an OTTB Story by Casey Laughter- There are good people in this world, but there are also plenty of not so good people. A gelding named Coteau Curlin figured this out early in his life. The Curlin gelding was bred in Southern Louisiana at a farm named Coteau Grove Farm. While Coteau Curlin had been through a lot, he was a very calm horse. While he was nervous, he never spooked at a thing. The gelding also proved to be smart. Coteau Curlin raced only twice as a juvenile before he suffered a fractured front sesamoid in his second start. The gelding was immediately retired, as the owners knew he could eventually turn into a nice horse for another discipline. Coteau Grove Farm’s breeding manager had a small farm of her own where she had a small family and her husband trained a few thoroughbreds. She offered the farm a place for Coteau Curlin to rehab at and grow. It was, of sorts, a free lease. The intention was to rehab the gelding into a riding horse for the owner of Coteau Grove Farm’s granddaughter. Kaitlin Farmer was employed at Coteau Grove Farm in the summers, mostly working with gaited riding horses and training them. That second summer Kaitlin was at Coteau Grove Farm, she was enjoying a lunch with the owner of Coteau Grove Farm’s granddaughter when she overheard a phone call. The owner of Coteau Curlin has discovered that his horse had turned up at a training track under an unfamiliar trainer’s name. Over several days, the story was revealed. Coteau Curlin had been purchased by the unfamiliar trainer from the breeding manager (now former breeding manager), claiming to not know that the horse was not hers to sell. The intention of theirs was to sell Coteau Curlin, race him a few times to turn a quick profit, and then send him to auction to hopefully leave no trace of him. When lawsuit was threatened, the unfamiliar trainer turned Coteau Curlin over to the rightful owner and breeder, Coteau Grove Farm. Quarantine was where Coteau Curlin spent his first few days back at home. Eventually, the gelding was put back on the breeding farm and this is when Kaitlin met the horse. What Kaitlin did not expect was how skinny the gelding was. Along with the terrible condition of his feet, the gelding had a long road to recovery. However, Kaitlin noticed something special about the horse. Days passed still, and Kaitlin knew this horse was special. 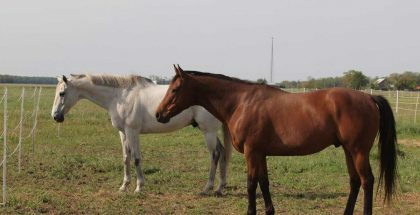 Both she and the owners wanted nothing more for this horse than to have him to be with a good person in a good home. Well, that is where Kaitlin really found out how special this horse was. One dollar changed Kaitlin’s whole life. Kaitlin attended college at the University of Kentucky in Lexington. 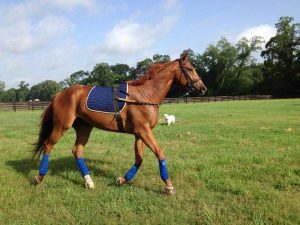 Kaitlin shipped the gelding with her to Kentucky, boarding him at a nearby barn that allowed her to work off part of her boarding fee. Coteau Curlin stands in the cross ties without being tied; he also enjoys long trail rides and never shows any sign of acting up when working around multiple horses in the indoor arena. The gelding is easy going and loves what he does. What does Coteau Curlin do? Well, Kaitlin and Coteau Curlin board at a dressage barn! He enjoys a good round of jumping. 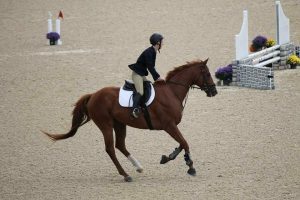 The barn Kaitlin and Coteau Curlin are at is home to another OTTB and the woman who owns it wants them to attempt hunter class, so Kaitlin and Coteau Curlin may be moving into new territory. 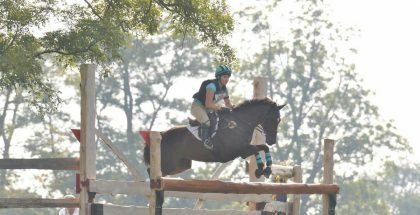 With the addition of Coteau Curlin to Kaitlin’s life, it has helped Kaitlin get more involved in the OTTB community. In 2015, Kaitlin volunteered at the RRP makeover, interned for a summer at the Maker’s Mark Secretariat Center, volunteered at Keeneland for the Breeders’ Cup, and helped with some local horse shows.